The 2010 Shadow Valley "Showcase of Homes" benefiting Susan G. Komen for the cure is in progress... Don't miss out this weekend - 29th-31st of October at Shadow Valley in Rogers, AR. & on Friday October 29th from Noon - 1pm & again from 4-7pm I will have these two Homes for sale in Shadow Valley OPEN for your viewing as well! Enjoy Lunch from Noon-1pm compliments of Nicky Dou with Century 21 Exclamation Realty (Realtors and the Public are welcome) and Wine and Cheese from 4-7... Realtors bring your business cards - First National Title Company will be giving away some great prizes! 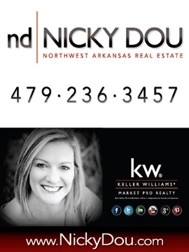 Realtors in Northwest Arkansas - Sell a Home… get an iPad! Relocating to Arkansas? Bentonville, Arkansas Home for sale!